Austria’s domestic wine industry has been working hard for several years to improve the profile of its quality sparkling wines. A first step was to establish the Austrian Sparkling Wine Committee – analogous to Austria’s Regional Wine Committees – in 2013. And now, a three-tier quality pyramid for sparkling wine from Austria has been developed in close cooperation with the Austrian Wine Marketing Board (AWMB). The pyramid was introduced on October 22nd – the Austrian Sparkling Wine Day. Every year, the Austrian Sparkling Wine Day is celebrated on October 22nd. Through numerous events, sparkling wine lovers can enjoy getting to know Austrian sparkling wine and how it is made, tasting its range of varieties and learning about its many facets. In addition, the Austrian Sparkling Wine Day serves mainly to increase awareness of the quality, variety and origin of Austrian sparkling wine in the restaurant, retail and consumer sectors. At the same time, October 22nd signals the beginning of the sparkling wine high season. By the end of the year, around 12 million bottles of sparkling wine will have been consumed – this corresponds to approximately 45% of the total annual amount. Austrian Sparkling Wine Committee, founded just in 2013, and with the energetic participation of the sparkling wine producers, the structure of a three-tier quality pyramid for Austrian Sparkling Wine has been established together with the AWMB. The top category in the pyramid is on a par with the highest standards maintained by the world’s leading sparkling wines – such as Champagne or Franciacorta – and in certain aspects, even surpasses them. 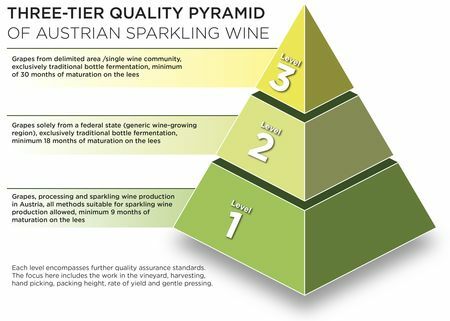 The basis category (Level 1) of the pyramid features stricter minimum requirements for Austrian quality sparkling wine. It guarantees mainly the Austrian origin of the grapes and base wines as well as the sparkling wine’s minimum maturation period of nine months on the lees. 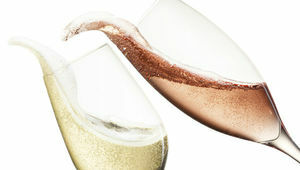 At the second level, sparkling wines must be produced according to the traditional method, namely, bottle fermentation. The grapes and base wines must come from a generic wine growing region (federal state) and the maturation period on the lees must be for at least 18 months. At the highest category of bottle-fermented sparkling wine, the grapes may be picked only from a single wine community (such as Poysdorf, Langenlois, Gols and Gamlitz), whereby vineyard site designations are possible. After bottle fermentation, the sparkling wine in this category may be released on the market at a minimum of three years following the harvest including maturation on lees for at least 30 months. Each level encompasses further quality assurance standards. The focus here includes the work in the vineyard, harvesting, hand picking, packing height, rate of yield and gentle pressing. Criteria for the sparkling base wines and for the checking and control of the quality levels are being developed and defined in detail over the coming months. These will be accompanied by a marketing strategy – designed together with the AWMB – that will effectively communicate these new categories. The precondition for the effectiveness of this strategy is the incorporation of this strict, quality-oriented body of regulations into the Wine Law, which is planned for 2015. According to a study by A.T. Kearney, the regionality of products is becoming increasingly important. The survey confirmed that, for customers, regional origin as a buying decision criterion is even more important than the organic food qualification. This development also underscores the current figures: not only has the total volume of sparkling wine since 2008 – the year before the “Day of Austrian Sparkling Wine” initiative began – increased by about 30 percent compared to the year 2013 (source : AC Nielsen), but also the share of Austrian sparkling wine rose to well over 30 percent. In other words, of every three bottles of sparkling wine consumed in Austria, at least one of them is produced in Austria. This means that the harvest total of Austrian sparkling wine makes up about 10% of the domestic wine production. To make sure that a domestic premium product is poured, the sparkling wine producers recommend a careful examination of the label on the bottle: the designation “Sparkling Wine Made in Austria” (Sekt hergestellt in Österreich) is not synonymous with “Austrian Sparkling Wine” (Österreichischer Sekt). Only when 100 percent of the wine comes from Austria and the production of the wine takes place in Austria, then the product can bear the label “Austrian Sparkling Wine”.